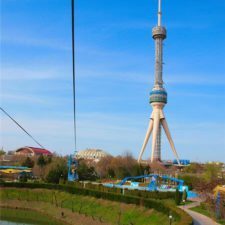 MainTours to Uzbekistan & CAUzbekistan holiday tour packagesNew Year in Uzbekistan 2019. 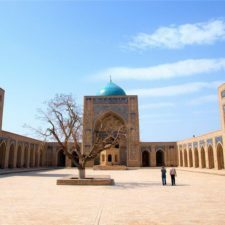 Holiday tour to Uzbekistan. 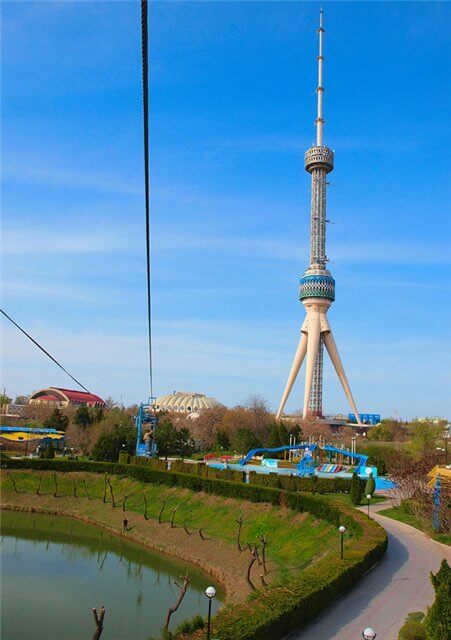 Arrival in Tashkent by international flight, passing border and passport control (1 hour). Meeting, welcoming tourists, transfer to hotel and check-in is after 14:00. 07:00 – Transfer to the train station. 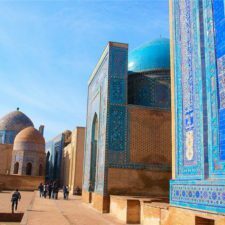 08:00 – Departure to Samarkand by high speed train “Afrosiоb” (350 km). 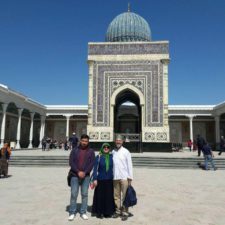 10:08 – Arrival in Samarkand. Meeting at the train station, transfer and accommodation in the hotel. 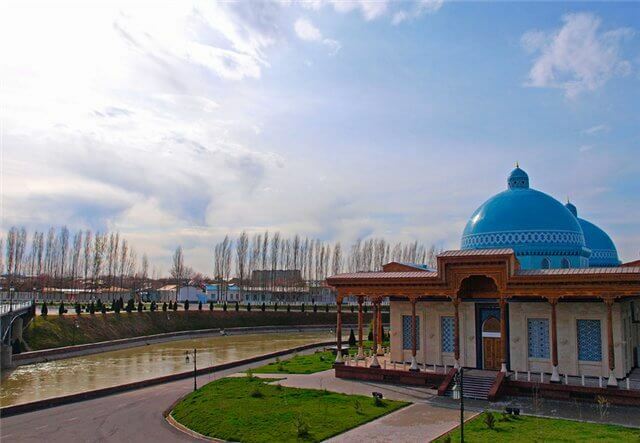 Gur Emir Mausoleum– Tamerlan’s tomb (14-15th c.) that was built for Temur’s grandson Muhammad-Sultan and the tombs of three other Temurids – sons of Temur – Miranshah and Shahruh and his grandson Ulugbek, Registan Square (“House of Spirit”)(external visit) – the legend says that under the dome there is a box with seven hairs of Prophet Muhammad (14th c.), Registan Square (“A sandy place”) – the major square of Samarkand: Ulugbeg Madrassah – Sheikh Khodja Akhrar and poet Djami were among outstanding graduates of the Madrassah (15th c.), Sher-Dor Madrassah (“Having tigers”) (17th c.), Tillya-Kari Madrassah (“Coated by gold”) – the rich gilding on the dome, walls and mihrab surpassed all other famous buildings in Central Asia (17th c.). New Year’s Eve dinner and fairy show program in a cozy restaurant with New Year’s characters Ded Moroz (local Santa Claus) and Snegurochka (Snow Maiden). 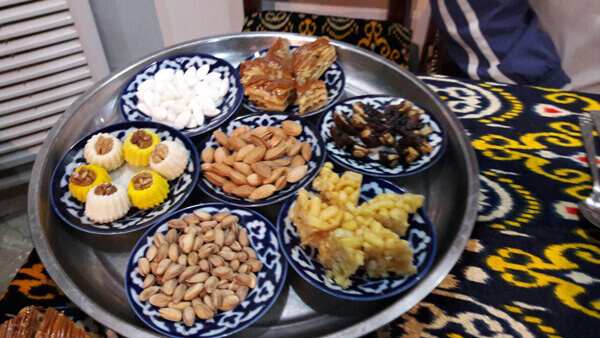 During the festive dinner, guests will have the opportunity to try a variety of delicious New Year’s dishes and take part in interesting and fun New Year’s games and drawings. You can also join the disco with both modern and popular songs of the 80’s and 90’s. 23:30 – Meeting in the lobby of the hotel and departure to the Registan Square. 23:45 – New Year’s Eve in the beams of multi-colored spotlights on the famous Registan Square with champagne and congratulations to each other on the New Year. Returning back to the restaurant and continuation of the banquet. Late breakfast is in the hotel. The architectural complex Shahi-Zinda (Alive king) – necropolis on the slope of the Afrosiab hill is connected with Kusam ibn Abbas – the cousin of Prophet Muhammad (11-15th c.). 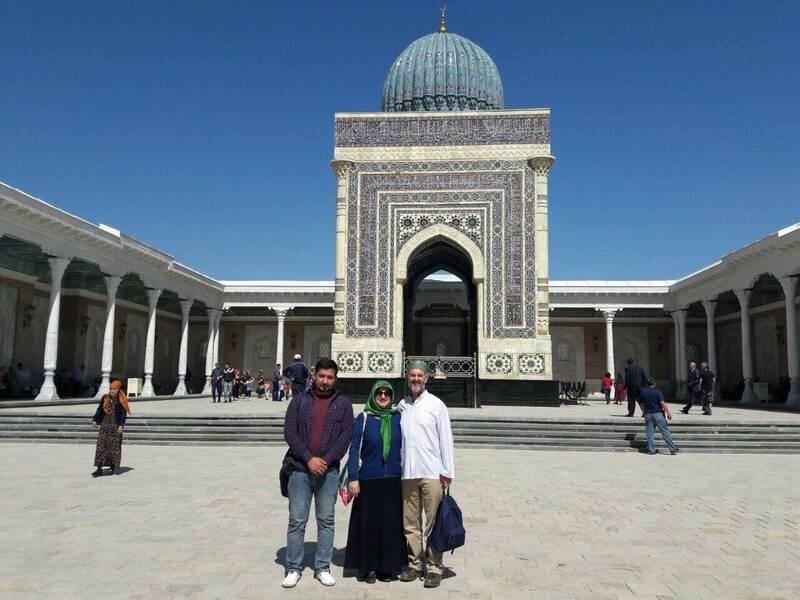 Visiting Ulughbek’s Observatory (15th c.) Cathedral mosque Bibi-Khanym that was named after the oldest wife of Tamerlan (14th c.) and world famous Samarkand bazaar – “Siyob”. 08:45 – Transfer to the train station. 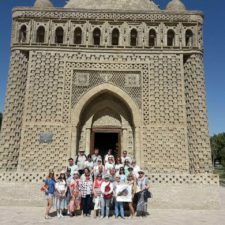 09:43 – Departure to Bukhara by high speed train “Afrosiоb” (280 km). 11:17 – Arrival in Bukhara. Meeting at the train station, transfer and accommodation in the hotel. 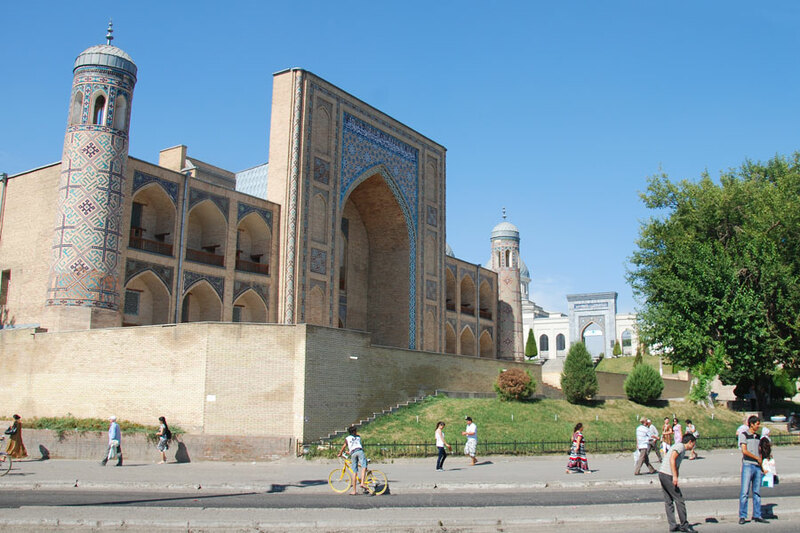 “Khanaka and madrassah of Nadir Divan-Beghi” – a massive rectangular structure that was a place for the refuge and meditation of Sufis (17th c.), “Kukeldash Madrassah” (16th c.) – one of the biggest Bukhara madrassah, “Lyabi-Hauz” ensemble – the largest artificial reservoir of medieval Bukhara – is very popular among tourists (14-17th cc. 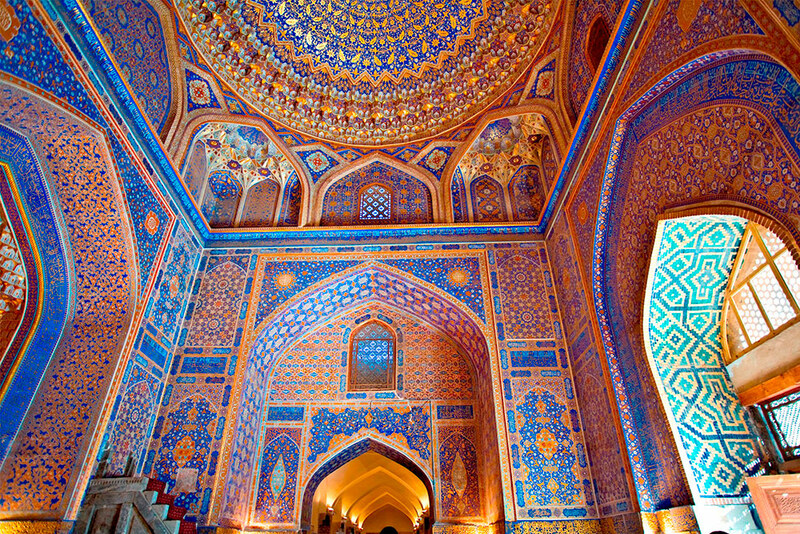 ), complex “Poi Kalon” (“Beneath the Great”): “Kalyan Minaret” – the main symbol of sacred Bukhara that symbolized authority and power of spiritual governors. 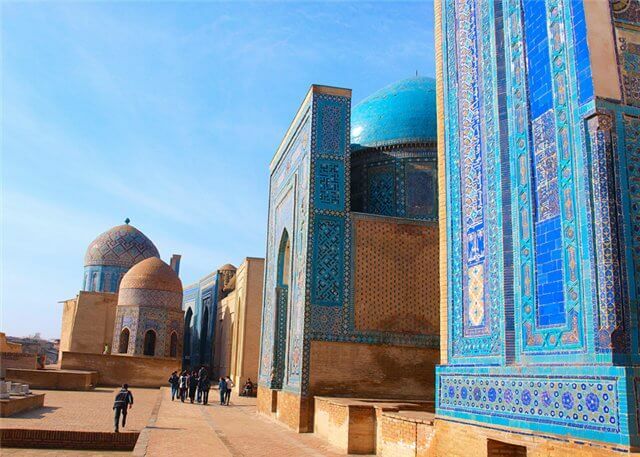 (12th c.), “Kalyan Mosque“- its area of 130×80 m surpasses Bibi-Khanym mosque in Samarkand, “Miri Arab Madrassah” – active madrassah is one of the most esteemed spiritual Islamic universities (16th c.), “Taki Zargaron” – the dome of jewelers (15-16th cc. 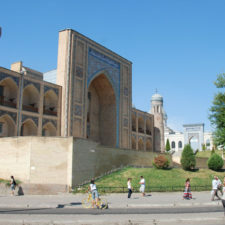 ), “Ulugbeg Madrassah” – one of the 3 madrassahs constructed by grandson of Tamerlan – Ulugbeg (15th c.), “Abdulaziz-khan Madrassah” – a traditional madrassah with 2 floors of hudjras and a mosque on the central axis ( mid. of 17th c.), “Tim of Abdullah-Khan madrassah” (1588-1590 yy. ), atlas shops. 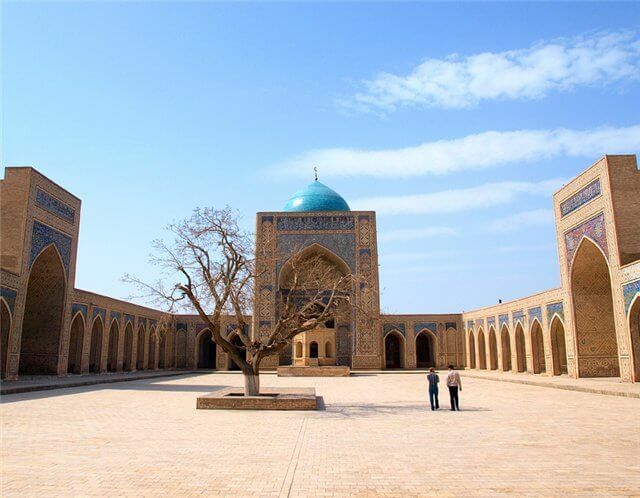 “Magoki-Attari Mosque” – the most ancient mosque in Bukhara (12th c.) is considered a masterpiece of Bukhara architecture. 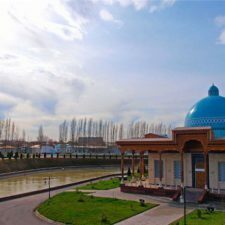 “Mausoleum of the Samanids” – the most ancient brick building in Central Asia, a masterpiece of world architecture (9-10th c.). The mausoleum of Chashma Ayub that belongs to esteemed “places of trace” left by saints (14th c.). 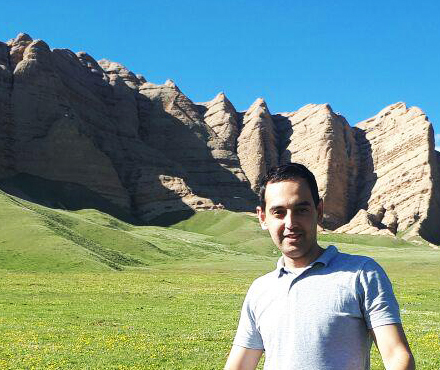 – the legend says that once the bible prophet Job (Ayub) visited this place. 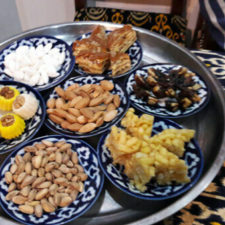 Museum of Imam Al Bukhari. 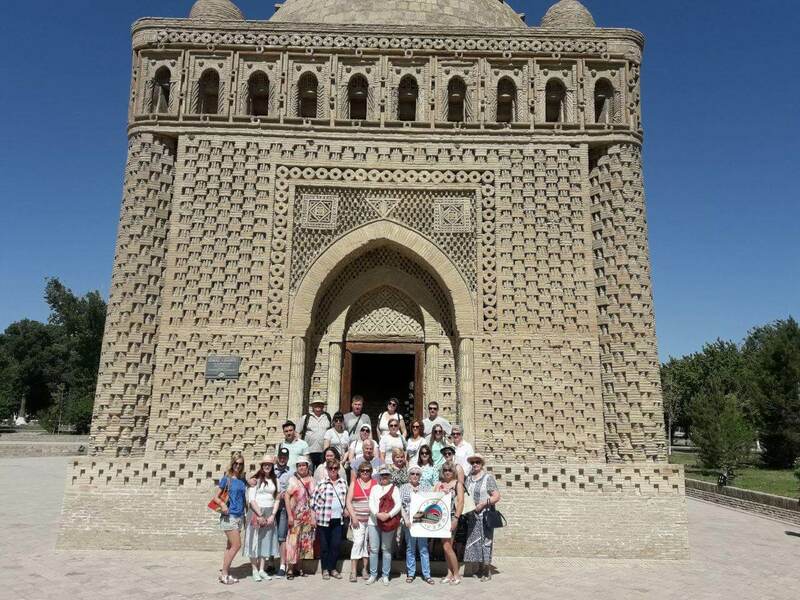 “Bolo-Houz Mosque” – the only monument of medieval Bukhara (beg. 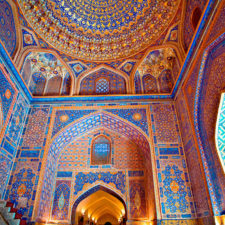 of 20th c.), “Ark fortress” is the center of Bukhara statehood (4th c. BC), silk carpet shops and visit of Jewish quarter. 14:30 – Transfer to the train station. 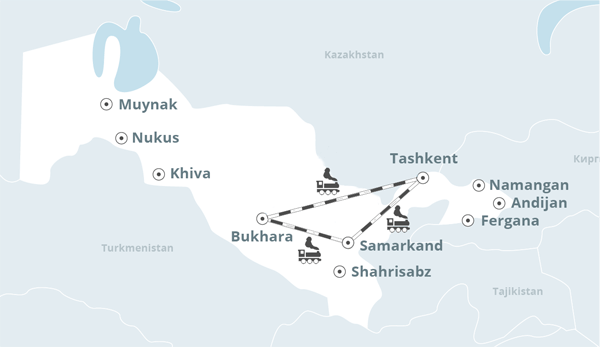 15:52 – Departure to Tashkent by high speed train “Afrosiоb” (592 km). 19:40 – Arrival in Tashkent. Meeting at the train station, transfer and accommodation in the hotel. Note: the program may change at booking time.